Living sustainably may be easier on a few acres in the country, but that doesn’t mean you can’t use all the resources around you! You may not be able to raise your own firewood or have an orchard out back. In fact, some of us may barely have room for a small garden! Thankfully, that doesn’t meant that we city dwellers can’t sustainably harvest from our local environment though! 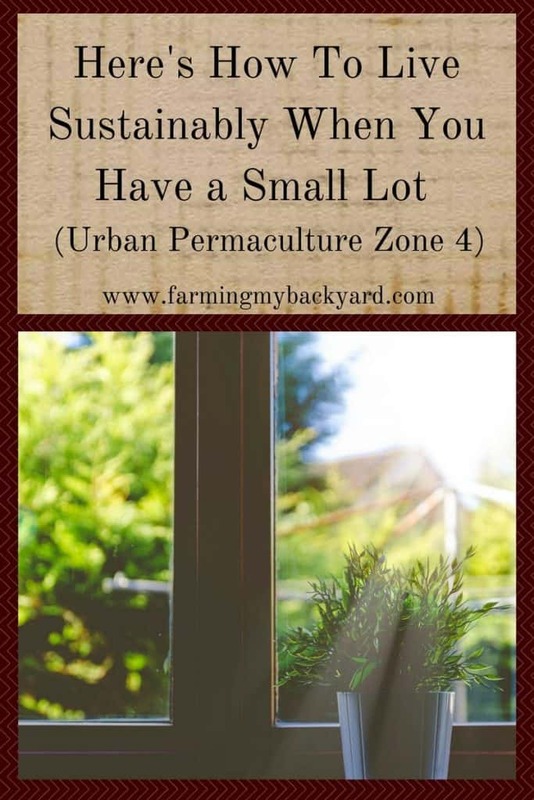 Urban permaculture in zone 4 may look different than on a big homestead, but city dwellers can use the same principles in a forest or the urban jungle. What Is Permaculture Zone 4? 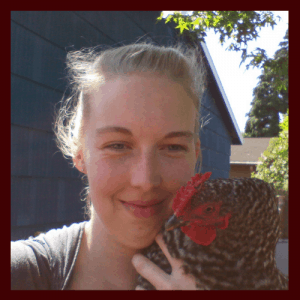 If you are not familiar with permaculture, here’s a teeny tiny run down. If you want even more details, check out 11 Reasons Why You Need To Know About Permaculture and the gardening section of our resource page. The word permaculture is a combination of the words permanent agriculture. The idea is that we design our land use in a way that is harmonious for individuals, communities, the environment, and animals. The focus in on how all of the different elements relate to each other. A good permaculture design mimics principals found in nature to achieve maximal yields. Permaculture refers to the design and planning aspect, and it can use lots and lots of different techniques such as organic gardening, mulches, rain water catchement, and a lot, lot more. Permaculture principals can be applied to any site of any size. You can practice permaculture as one person in an apartment, or it could be applied on a nationwide scale. That would be awesome if it happened! Of course the strategies that each site and group would use vary based on sooooo many factors. I think this is why permaculture isn’t quite mainstream yet, is because there is no cut and paste design that you could slap onto your property and have work. It takes study and an understanding of how everything fits together to get it right. I’ve been reading about permaculture for a couple years and it seems like every time I read a new page in a new book something clicks that I didn’t understand before. One of the principals of permaculture is the idea of zones. The idea of zones is essentially put the things you use the most in the closest, most accessible space. We do this automatically when we arrange the inside of our homes. We put the dishes in the kitchen and the clothes in the bedrooms, for example. It’s the same idea applied to your landscape. Zone 0 would be your house. Areas that you visit daily are your zone 1, such as your driveway, kitchen garden, compost bin. Zone 2 is for things that still need regular attention, but maybe a little less frequently such as bees, shrubs, and chickens. Things that need minimal care such as grazing livestock, and orchards belong in zone 3. Zone 4 is semi wild used for foraging, firewood production, and zone 5 should be wildlife conservation area. How Do Zones Work In A Small Lot? For example, in my tiny city lot I use it mostly as zones 1 and 2, with a corner of zone 3. I think of my neighborhood and city as additional zone 3 and all of zone 4. These areas I think of as my forest to wildcraft and to forage. Start looking at your neighborhood and city as potential crops to be harvested. It’s amazing when you start noticing all the available resources that before looked like weeds or rubbish! Within a quarter mile of my house along a public bike trail I have noticed apple trees, pear trees, currants, blackberries, plantain, thistles (they actually are really yummy! ), rose hips, acorns, black walnut and dandelions (SO useful!) all available for foraging. I’m sure there are more, but those are just the ones I feel comfortable harvesting so far. The hardest part is learning how to identify and use what’s around you. I have friends who gather chanterelle mushrooms from the yards of friends and family. Neighbors have asked if I would like to pick cherries they are not planning to harvest. What Counts As Zone 4 In The City? Another purpose of zone 4 is timber production. In a larger property this is woodlots for firewood, building, or furniture making. In an urban setting you won’t be planting, coppicing, or cutting your own trees, but it is possible to get free wood and furniture by knowing where to look and not being afraid to ask around. If people know you are willing to take wood off their hands they will take advantage of the free hauling and as you to come get it. Frequently unwanted furniture can be found as well and all it needs is a little attention, repair, and refinishing to become useful again. Sometimes even that isn’t needed. In fact as I type this I’m sitting at a solid wooden desk we found for free and in an office chair that was given to my husband when his employer purchased new ones. We have also completed many building projects around the yard with scavenged wood. My first raised beds were from free scrap wood, as was our first hen house. Our fencing around the goat pen was made out of free pallets from a neighbor who was moving. He had gotten the pallets from another neighbor who made a haunted houes for Halloween out of them. The first neighbor had been collecting them from businesses, but didn’t want to save them for next year. Another useful product is urbanite, which is essentially recycling concrete. I wrote about ripping up a portion of our driveway, and reusing the concrete chunks here. Every year a significant portion of our winter heat comes from scavanged firewood. Here’s a post about finding free firewood. People are usually more than happy to let you haul away their unwanted wood as they clean up around their yards. You may have to split, haul, or saw it, but it’s there. So many things are free to be harvested if you know where to look! Where Do I Look For Free or Reused Supplies? All of these places listed below are great locations to start searching for zone 4 harvests in an urban setting. It may not be as pretty as walking through your orchard or woodlot, but it’s good for the environment (and budgets, I might add) to use and reuse what is immediately available to us. I do this all the time! We collect so much free stuff around the neighborhood, and working for a city parks department helps me to know where all the good edible plants are located. It also gives me good info for guerilla gardening! I bet! We have fruit trees lining some bike paths near our house. They are kind of hidden so only the people who know about them, know where they are. I find that reading about Permaculture over and over is like reading the Bible over and over. You always get something new each time. Your observation of neighborhoods and communities as zones 3 and 4 is genius! I never saw it that way before. Thank you! I agree, every time I learn more about permaculture I realize how much there is to know.